Billy performs "You May Be Right" live in Russia in 1987. 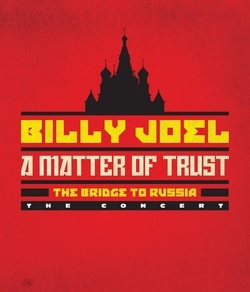 This video was not released in the 1991 concert video on VHS ("A Matter of Trust") , but was released in 2014's "A Matter of Trust: The Bridge To Russia." Billy's live performance of "You May Be Right" in Russia did not make 1987's Kohuept album nor the Live in Leningrad video from 1991. But it was included in 2014's A Matter of Trust (CD and DVD). This version has country, honky-tonk feel to it. The song is Billy at his pugnacious best, telling his listener that Billy may be crazy, but he just may be what the listener is looking for. It's a classic rock-and-roll theme, good girl falls for the "bad" guy. The bad guy may be uncouth, but his rough charms seem to be working ("I told you dirty jokes until you smiled"). This is not unlike the protagonist in "Only The Good Die Young." Here, Billy uses a Mick Jagger-like vocals to enhance the "bad" guy image of the song. It's a fun song, and listeners agreed, sending it to #7 on the charts when it was first released in 1980 on the Glass Houses album. "You May Be Right" has become a favorite in concert and of many cover bands. Its honky-tonk feel which makes it popular for country stars who are rocking out like Keith Urban and Garth Brooks, who both perform it live. Another live version of "You May Be Right," this one from 1984's concert in Wembley Arena which was broadcast on UK television.